A popular ringtone track is set to scoop the top spot in the UK singles chart, on course to beat Coldplay's comeback to number one on Sunday. The Crazy Frog's Axel F is currently outselling the Brit-winning band's new single Speed of Sound, according to early retail reports. 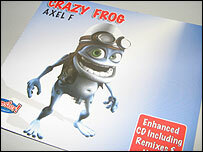 HMV said the Crazy Frog was now almost certain to top the new chart. Coldplay recently became the third UK band to have a new entry in the US Top 10 singles chart with Speed of Sound. They had been tipped to take the UK number one slot with their first single for two years. HMV spokesman Gennaro Castaldo said Crazy Frog would be the first hit ringtone to cross over into the singles charts in this way. He said: "Music purists might not be too happy at the prospect of the Crazy Frog outselling Coldplay. "But it shouldn't come as that much of a surprise when you consider its huge novelty appeal and the massive amount of exposure it's currently getting. "Kids obviously find it cute and cool, but students and even office workers seem to be drawn to its rather kitsch, ironic appeal. "The only real issue is whether the record label can press enough copies to keep up with the huge demand that we're seeing right now." The profile of the Crazy Frog mobile phone ringtone has been raised in recent months through heavy television advertising. It is a new version of the Beverly Hills Cop movie theme tune by Harold Faltermeyer, which reached number two in the UK 20 years ago.